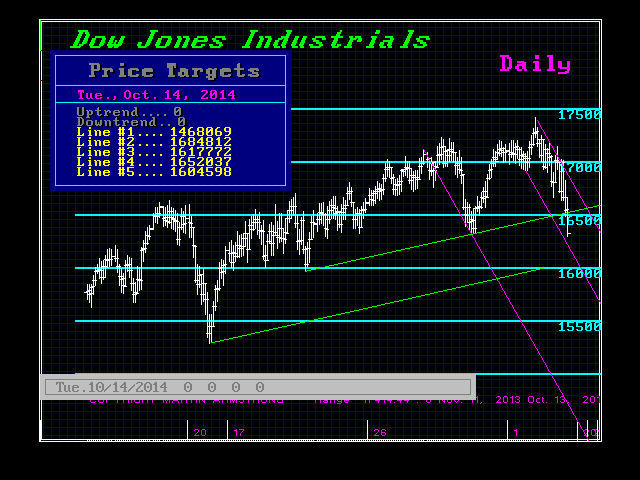 The Dow held the Daily Bearish at 16319. Therefore, if the low of 10/13 holds, we should bounce back into Thursday-Friday. But this would be just a bounce. We can see from the technical chart that once that uptrend line was broken, there was just the collapse. Typically, we would rally back and bounce off of that and then turn back down to test the 15900 area. A rally into the end of the week would still warn we may see the low the first week of November. If we were to make new lows and fall to test the 15900-16000 level this week, then a rally back into November 3rd week is possible with a turn back down into January. That would be the shifting of the cycle warning we are dealing with a cycle inversion that would extend the high into 2017-2018. That would be VERY VERY VERY bearish for government. We would most likely see a strong dollar rally breaking most other currencies. The high dollar would set off another round of sovereign defaults since everyone issued debt in dollars and are thus short. That would push the talk of moving toward some one world reserve currency and then we may see gold come into its own at last. Obama’s former chief economist has already suggested the US should abandon making the dollar the reserve currency. That is nice to say, but there is no alternative until the dollar rises and bankrupts many. The US national debt will then rise in real terms and that will turn the economy down even harder as the high euro wiped out Greece. « So When Will We Know?